Increasingly, we’re losing our sense of home. As Generation Rent moves from houseshare to houseshare, other things start to take on the meaning that was once contained by four walls: people, habits, objects. We have more and more stuff, invested with more and more emotional value, but less and less space in which to house it. Dante or Die’s new show is interested in all that stuff – the detritus of living, and what it means to us. It’s being performed in some of the many self-storage warehouses that are doing booming business in a nation of space-challenged hoarders. These echoing, artificially cool spaces are odd environments, their impersonal exterior containing sometimes intensely personal artefacts. This contrast is just one of the ideas that Dante or Die play with in Handle With Care, which sees one woman’s life through the things she decides to keep. We first meet Zoe in 1989, as her brother Miki prepares to go travelling. Together they pack away his belongings and get ready to part ways, a close relationship quickly emerging from this small interaction. Before long, though, Zoe is dashing down the corridor, trailing fragments of her life over the following years: letters, photographs, items of clothing. As unacknowledged flies on the wall, we follow her through other brief yet revealing scenes in this labyrinth of self-storage units. She prepares for new phases in her life, or wades through the debris of failed relationships and stalled adventures. Through reappearing items – a painting, a soft toy, a rucksack – we begin to see what this deliberately ordinary character holds dear. Handle With Care sits somewhere between narrative-driven theatre and immersive installation, never quite settling on one or the other. The actual moments of packing and unpacking are concrete and usually momentous chunks of life: partings, goodbyes, new starts. 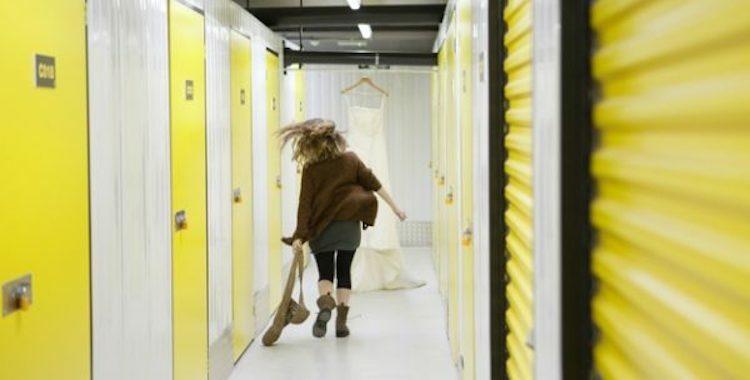 But linking these inevitably selective moments (how much of someone’s life can really be spent in a storage unit, after all?) proves more of a challenge. In between the more conventionally dramatic and realistic scenes, we are led through passages and into spaces scattered with more abstract clues to Zoe’s existence. Instead of filling in the narrative blanks between scenes, Dante or Die offer us teasing hints. This fragmented approach produces some individually striking moments. One room in particular mesmerisingly conveys Zoe’s passage from partying youth to responsibility-filled motherhood, swiftly traversing a number of years. As we walk in, lights and music are pulsing and we are thrust into the middle of a rave. But then, with a slow, hallucinatory progress, our surroundings change their character. The figures dressed in rabbit suits transform from fellow dancers into giant cuddly toys. We begin to notice that the decorations hanging from the ceiling are actually relics of childhood. Disco lights become night-lights. And there’s a beautiful transition from one stage in life to the next, as Amy Dolan’s young Zoe confronts the reflection of her older counterpart, played by Rachael Spence, before the latter seamlessly takes over from the former. As a whole, though, the theatrical experience of Handle With Care never quite coheres. The scenes themselves are individually engaging, and there’s a certain thrill to exploring this strange, otherwise deserted space, but the audience contract feels confused. For the most part we are steadfastly ignored by the performers, often having to dodge out of their way with stifled giggles. In the sometimes clumsy transitions between scenes, though, Zoe seems to half-acknowledge us, and in the final moments of the show our cloak of invisibility is suddenly removed and we inexplicably become an active (if limited) part of the narrative. There is, in line with the instruction of the title, a lot of care contained in this production. Zoe’s unremarkable yet moving story is told with tenderness and compassion, giving attention to moments in life that might otherwise be ignored or forgotten. There’s care and precision in the tricky logistics of the show, too, and in the movement of an audience through it. The performers skilfully accommodate spectators without letting them break the fiction, moving playfully close to us – as if to say “we know you’re there really” – but never allowing our two separate worlds to collide. This holds and reassures an audience, who are not intimidated by the possibility that they might be asked to take part in the performance, but it can also maintain a frustrating tension between proximity and distance. What, ultimately, is our role in the performance? This question is never resolved by Dante or Die, who seem more interested in bringing us close to these scenes than interrogating our presence. Handle With Care is also, ultimately, more caught up in its narrative than in the wider concerns it leaps off from. Perhaps all we can take from Zoe’s story is that stuff is as meaningless as it is meaningful. Without a home or a human to cherish it, it’s all junk in the end.